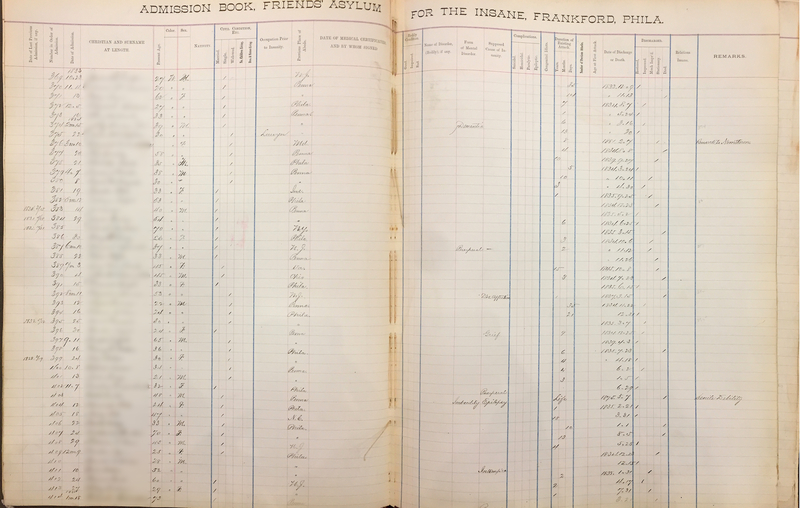 Over the first two decades the Friends’ Asylum admitted 540 patients. Fortunately, very good records survive—in the form of an Admissions Book, other admissions and discharge documents, Superintendent’s Daybook, and Medical Casebooks—that allow us to reconstruct what types of patients were at the Asylum, what forms of insanity staff at the Asylum recognized, where patients came from, how much they paid to stay there, and what sorts of treatment they received. Unfortunately, all that information is not (yet) in a form that is very handy. But even this overview of patient demographics drawn from the Admissions Book raises interesting questions. Pages from the “Admission Book, Friends’ Asylum for the Insane” showing entries for patients nos. 369-414, admitted from October 23, 1833 to January 15, 1834. In the first twenty years, the Asylum readmitted 74 patients more than once. One male patient was readmitted 10 times, another two were readmitted 6 times, approximately 60 were readmitted at least twice. Extreme readmission rates seem to have declined slightly in the 1830s, i.e., the numbers of patients readmitted more than twice. Before being admitted to the Asylum patients had suffered from their affliction anywhere from 2 days to 48 years. The average length of time admitted patients had been insane was about 3 years and 4 months. Patients stayed in the Asylum as few at a couple days (many of these very short stays ended in the patient’s death) to nearly 47 years (many of these very long stays also ended in death, though probably for different reasons). 70 patients (42 males; 28 females) admitted during these first two decades spent less than a month in the Asylum. 30 patients (18 males; 12 females)admitted during the same period spent more than 10 years in the Asylum. While the vast majority of patients were local—198 from Philadelphia, 189 from Pennsylvania, and 88 from New Jersey—as the Asylum’s reputation grew in the 1830s patients started turning up from more distant places, e.g., Virginia, North and South Carolinas, Ohio, and Indiana. The early patient entries are incomplete, many of the columns in the Register were left blank. In the mid–1830s staff began recording both the forms and supposed causes of a patient’s insanity. “Mania” and “Dementia” are the two most commonly recorded forms of insanity. While both are so common as to seem generic labels rather than specific diagnoses, staff did distinguish between different causes of these generic afflictions. That the same causes give rise to different forms of insanity suggests staff were observing different symptoms. The range and types of supposed causes raise questions. How is “defective education” (suffered by a 17yo male; restored after a month) and “amenorrhea” (suffered by a 20yo female; restored after 3 months) related? At first glance, the first seems entirely social, while the second seems more like a biological cause. This information suggests many different topics to pursue and, as I mentioned previously, this summary hides fascinating individual stories (yes, Patient #33’s story is still pending). As I work through the other sources and analyze the information I compile, I will continue to post my conclusions. Stay tuned.